On rare occasions you chance upon a personality who has the resilience and tenacity to make such a startling impact on you that you are forced to rethink your priorities and curb those pity parties you indulge in. Frederika Menezes is one such person. She amazes and stupefies you with her positivity in the face of what others would consider an incapacitating physical disability. Her alma mater is People’s High School, Panaji. She stresses the fact she attended regular school as there is also the School for Appropriate Learning, which she never attended. Even in school, if people regarded her in a singular manner, she preferred to think of it as consideration rather than feel labelled in any way. She loved her books and disliked only two subjects, physical training and mathematics. Always popular for her cheerful nature, she had many friends throughout her school days and still maintains contact with some of them via texting, WhatsApp, Facebook, e-mails, etc. Frederika’s entry into the literary world was due to a classwork project where students were told to write a poem on Goa. While the other students had bench partners, Frederika sat by herself, dictating her poem to her teacher who acted as her writer. She says, ‘This was 8th grade. I dictated and our English teacher wrote. We were both stunned.’ It took her just fifteen minutes to produce an impressive poem that set her on the path of becoming a writer. Her inspiration for her poems is her friends, family, nature, the multitude of human emotions and sometimes her favourite celebrities. She says, ‘A simple thought can get me writing...’ Her first book, a collection of poems entitled The Portrait, was published in 1998, two years after passing out of school. In 1999, a poem written by Frederika was included by the International Library of Poetry, Australia, in an anthology of poems called Fire in the Heart . An avid reader, Frederika’s love of fiction/fantasy and romance novels spurred her on to write in those genres. The Pepperns and Wars of the Mind was her first novel published in 2003. It is a fiction/fantasy novel for children. The story gives the message of how good humour and a smile can conquer the debilitating tentacles of negativity. Her most recent offering is two books that were released in May 2014. Stories in Rhyme is a book of verse for children and the novel Unforgotten is a love story based in the UK and Goa. Unforgotten takes us along the main protagonist’s tumultuous journey through love lost and found. Frederika is not resting on her laurels though, and already has another novel in the works. 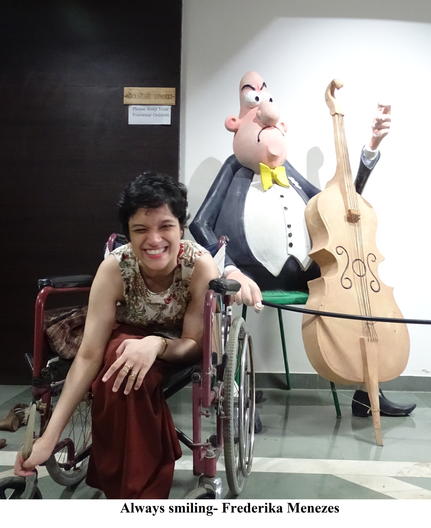 A vehemently vocal advocate for the differently abled, Frederika says she find the attitude of most people towards them, ‘Seriously, mind bogglingly pathetic!’ Society needs to convert its attitude of seeing the differently abled as a burden to society into something constructive. She says there should be, ‘… a broader mindset, a willingness to accept and respect, include, and not segregate. After all, a challenged person is also human.’ She exhorts people to help bring about practical changes that will enable the differently abled to be more independent. She abhors the idea of pity being extended to physically challenged people by calling them ‘children of a lesser God’ and ‘disabled’. ‘Give me a chance because I deserve a chance. Not out of pity!’ she says. At a talk called ‘Are We Normal’ she emphasised the baselessness of this idea of normalcy. We are all afflicted in some way or the other but it most cases it remains hidden. With the differently abled it is more obvious but it does not mean they are helpless or should be treated unlike the general population. She says, ‘It would be so boring if all were the same in looks, the way we think and our attitudes.’ She also criticised the lack of sensitivity when it came to facilities for the differently abled to help them move around without hindrance and enjoy the simple pleasures of life like watching a movie in the theatre seated in the upper seats. Frederika’s perpetual optimism belies her statement that she has her days when she feels low too. Her antidote is to kick herself and tell herself off. ‘I also visualize the things, people and circumstances I want to be with, have and own,’ she says. Her positivity is catching as she says she sees herself achieving success in every area of her life. Her beautiful, smiling face is certainly an inspiration for us all.